alaTest has collected and analyzed 72 reviews of Sony Handycam DCRTRV70 Mini DV Camcorder. The average rating for this product is 4.8/5, compared to an average rating of 4.0/5 for other Camcorders for all reviews. Reviewers are impressed by the design and price. The image quality and portability are also appreciated. Many are critical about the memory. We analyzed user and expert ratings, product age and more factors. Compared to other Camcorders the Sony Handycam DCRTRV70 Mini DV Camcorder is awarded an overall alaScore™ of 77/100 = Good quality. alaTest has collected and analyzed 32 user reviews of Sony Handycam DCRTRV70 Mini DV Camcorder from Amazon.com. The average user rating for this product is 4.7/5, compared to an average user rating of 3.9/5 for other Camcorders on Amazon.com. Reviewers really like the size and image quality. The price and portability also get good opinions. touch screen can get to be a hassle, otherwise this camera owns all. Others have commented on many aspects of this and some have provided you with loads of technical details that can be easily read at the SONY website, I'd like to comment on how this camera is used. Great video quality, great ease of use, compact design, well built, great lens, beautiful camera. 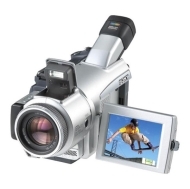 The DCR-TRV70 MiniDV Handycam Camcorder gives you a huge, easy-to-view color SwivelScreen LCD and a massive 2.0 megapixel resolution, delivering exceptional-quality digital video, digital audio, and digital still images every time you turn it on. It brings home the functionality of a digital still camera and digital camcorder all in one amazingly compact package. Sony ingenuity makes it ultra-functional, with convenient tools and powerful performance capabilities ranging from an advanced Carl Zeiss T Lens - which makes it possible to shoot video in more natural and true-to-life conditions - Memory Stick Media storage, an intelligent pop-up flash and a new touch panel (with included stylus) that can be used to access the functions of the camcorder. This network-ready camcorder also features Hologram AF for sharper focus, while the Super NightShot 0 Lux system allows you to take beautiful video images in the dark.